"Learning to paint & photograph - and have a holiday! "The magret de canard was sizzling on the plate, the dark red wine from Buzet - a local vineyard - was smooth and rich. The conversation was loud, lively and liberally interspersed with raucous laughter. This was what photography was about; this was what a holiday workshop should be; this was wonderful! It was the night of the third hard day of learning how professionals work at painting and photography. 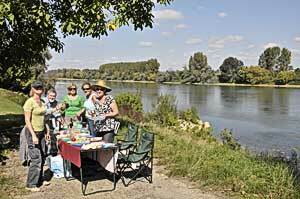 There were four of us on the course at Peter & Jill Evans's painting and photography holiday, in the Lot-et-Garonne: ourselves, a woman from Belgium and one from England, and that included three photographers and one painter, the class make-up varies each time. That evening, we were in the small house, just by the Canal des deux Mers, of a renowned restaurateur and chef, Vétou Pompele, now retired but cooking for us as a special favour for Pete and Jill's latest class of guests. The Lot-et-Garonne is a region of France less visited by tourists than nearby Dordogne, but filled with charming villages, productive farmland and very friendly people. Duck is a speciality here, and it is delicious. We don't do duck this way in Oz! A typical day started with fresh figs from the tree outside, croissants, baguettes, cheese and coffee, round the table with other guests, laughing about our inept French language and even more inept camera skills. Afterwards, a shortish drive to a tiny village, a picturesque bridge or a beautiful river, where Peter would patiently guide us through another round of picture taking challenges. We only stopped for morning coffee if we ganged-up and insisted to Pete. “Well OK but...” he would protest, “…the light wont wait”, or, “ We've got to go to this next place - the sky is perfect now”. Then it was back home to the beautifully and tastefully renovated ancient house, where we stayed in huge bedrooms with our own en-suite bathrooms, for a relaxing drink or a dip in the pool before dinner. The evening meal was either skilfully prepared by Jill or taken at a local restaurant. Everything, including meals and drinks was included in the cost of the week, except, that is, the coffee breaks - Peter wouldn't stop unless we paid! We Australians found it to be wonderful value for the holiday alone. The tuition, conducted in English, was first class. Peter and Jill have wide-ranging knowledge and skills, but more than that, they know how to pass it on, to inspire and motivate. It didn't matter that the three in the photo class had different skill levels and different aspirations, Pete adjusted his training for each of us individually and what he showed us was practical and really usable. Jill was an inspiring and demanding teacher for my painter wife. We both enjoyed a wonderful week. For myself, I learned a better way to control exposure and lots about looking at the scene and making sense of what I am trying to record. The result was quite dramatic. One evening downloading the day's work to my laptop, I got so excited “Look, Pete, look!” I shouted, “Look at these deep shadows and sparkling highlights; look at those powerful diagonals and the thirds - I couldn't have done that without you!” And it's true, I have a new and better way of working. I also had a wonderful and joyful week in the part of France my wife and I really love.